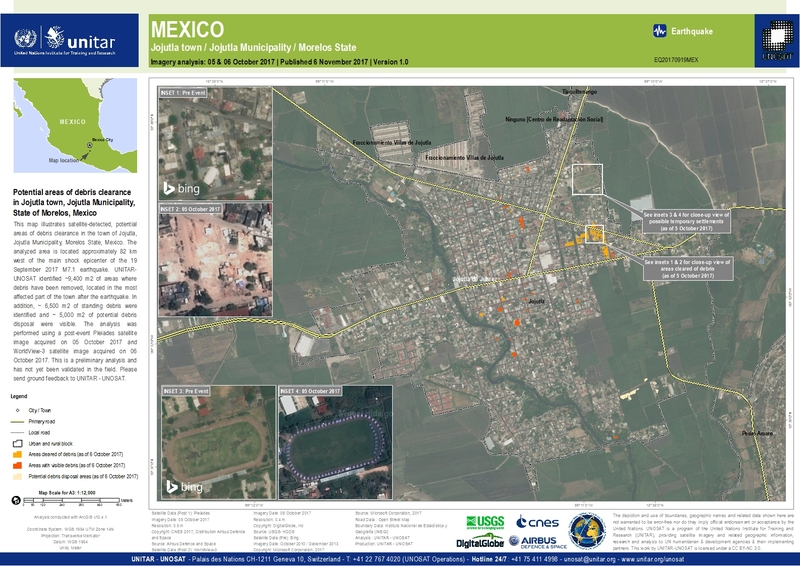 This map illustrates satellite-detected, potential areas of debris clearance in the town of Jojutla, Jojutla Municipality, Morelos State, Mexico. The analyzed area is located approximately 82 km west of the main shock epicenter of the 19 September 2017 M7.1 earthquake. UNITAR-UNOSAT identified ~9,400 m2 of areas where debris have been removed, located in the most affected part of the town after the earthquake. In addition, ~ 6,500 m2 of standing debris were identified and ~ 5,000 m2 of potential debris disposal were visible. The analysis was performed using a post-event Pleiades satellite image acquired on 05 October 2017 and WorldView-3 satellite image acquired on 06 October 2017. This is a preliminary analysis and has not yet been validated in the field. Please send ground feedback to UNITAR - UNOSAT.